Over The Rainbow is a ballad composed by Harold Arlen with lyrics by E.Y. Harburg. The song was written in 1938 and published in 1939 for the movie, The Wizard of Oz - sung by actress, Judy Garland. Versions: Many covers of the song have been recorded since the original version, with Israel "IZ" Kamakawiwoʻole and Eva Cassidy perhaps the most notable. 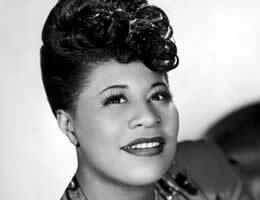 Ella Fitzgerald released the song in 1961 from the album, Ella Fitzgerald Sings The Harold Arlen Song Book . The version by Ella includes the entire song. Most versions start at the chorus and omit the first 2 verses. We have kept the chords on the beat as much as possible, as this type of song lends itself to a great deal of expressive freedom. Easier: G Major. If you are playing with the video, you will need to place a capo on the first fret. Chords in G major: G, G6, G7, Gmaj7, Gm, Gdim7, G#dim7, A7, Am, Am6, Am7, Bm, Bm7, C, C/G, C7, Cmaj7, C6, Cm6, D7, Daug, Em, Em/G, Edim7. Hea - ven      o - pens  a   mag - ic lane. Lead-ing from your win-dow pane. Just a step be-yond the rai  -   ain. Once in a lul - la - bye. That's where   you'll          find   me. Why then, oh why can't  I? That's where   you'll          find  me. Why, then oh why can't I? Born: Ella Janet Fitzgerald on 25th April, 1917 in Newport News, Virginia, U.S.
Over The Rainbow Sheet Music at MusicaNeo.Com - Piano/Vocal/Chords - Eb Major - 5 pages - Judy Garland. ELLA FITZGERALD chords and lyrics are property and copyright of their owners. "Over The Rainbow" chords and lyrics are provided for educational purposes and personal use only.